Aghamollaei, H., Mousavi Gargari, S., Ghanei, M. (2015). Therapeutic Potential of Glucose Regulated Protein 78 in Cancer. Journal of Applied Biotechnology Reports, 2(4), 305-310. Hosssein Aghamollaei; Seyed Latif Mousavi Gargari; Mostafa Ghanei. "Therapeutic Potential of Glucose Regulated Protein 78 in Cancer". 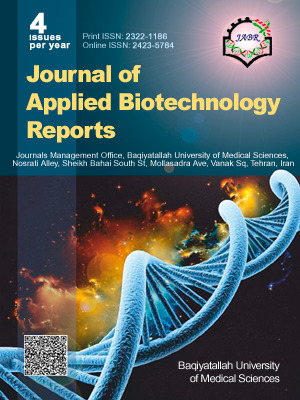 Journal of Applied Biotechnology Reports, 2, 4, 2015, 305-310. Aghamollaei, H., Mousavi Gargari, S., Ghanei, M. (2015). 'Therapeutic Potential of Glucose Regulated Protein 78 in Cancer', Journal of Applied Biotechnology Reports, 2(4), pp. 305-310. Aghamollaei, H., Mousavi Gargari, S., Ghanei, M. Therapeutic Potential of Glucose Regulated Protein 78 in Cancer. Journal of Applied Biotechnology Reports, 2015; 2(4): 305-310. Endoplasmic reticulum has a critical role in the synthesis and folding of secretory and membrane proteins. High accumulation of proteins in ER activates the unfolded protein response and glucose regulated protein 78 or GPR78 plays an essential role in this pathway. Unfolded protein response is activated in cancerous cells due to their adverse condition to survive and it has been shown that GRP78 can be expressed in tumor cell membrane. Overexpresion and localization of GRP78 makes it a suitable target for the treatment of cancer. This review describes cellular localization, biological function, and role of GRP78 in cancer induction. Methods for tumor inhibition via GRP78 are also discussed.